PHOTO: Ritva Torikka/Yle. 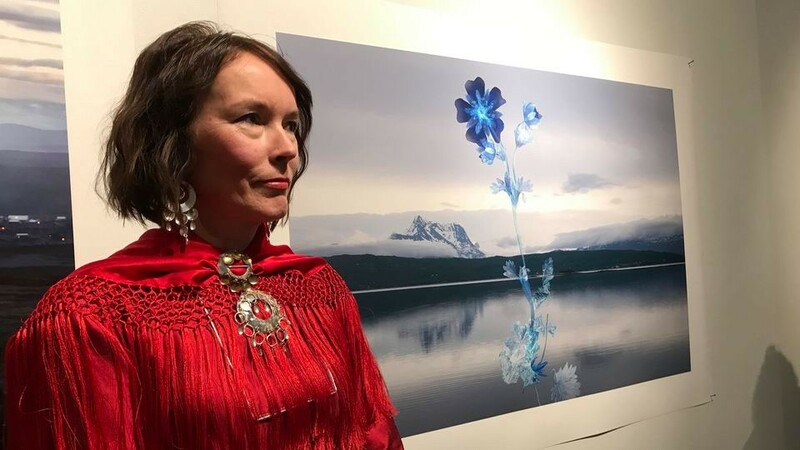 Marja Helander and her photograph “Sacred and mysterious” at the exhibition Viidon sieiddit – The New Dimensions of the Sámi Relationship to Nature. 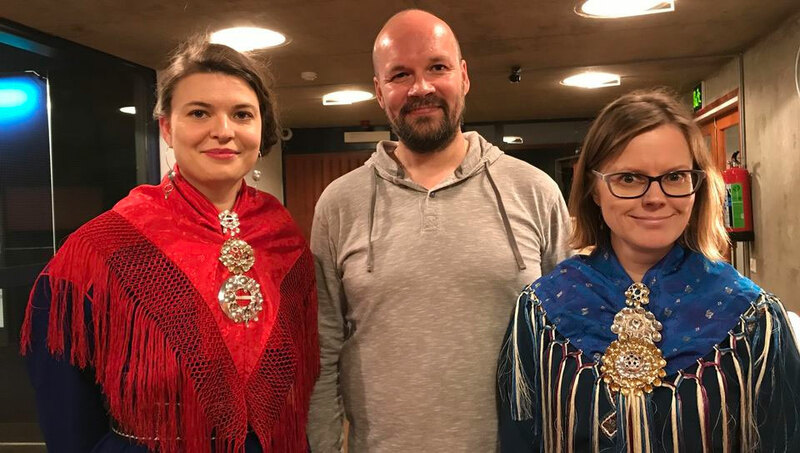 A group of Sámi artists want locals to reflect on their present relationship to nature and what this relationship looked like for Sámi people in the past. 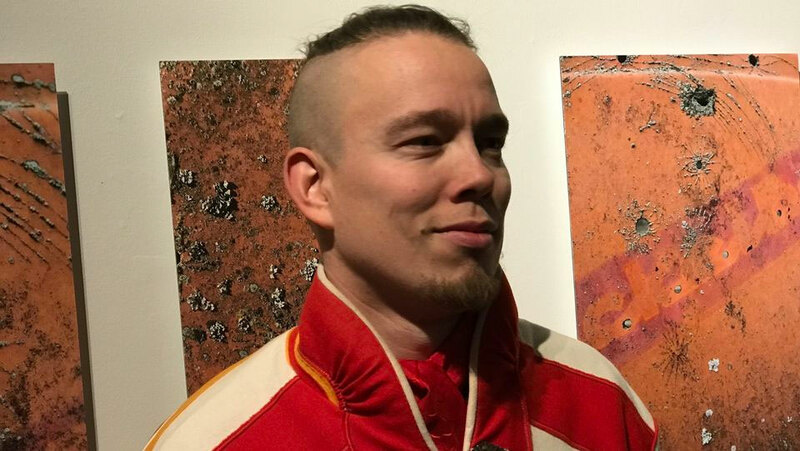 Viidon sieiddit – The New Dimensions of the Sámi Relationship to Nature, a new exhibition now available for the public at the Sámi Museum Siida in Inari, Finland, asks what kind of forces we worship to today. The exhibit is part of an art and research project, which will, in addition to works of art, yield a book and a record. The exhibition Viidon sieiddit consists of works of art by Marja Helander, Ailu Valle ja Stina Aletta Aikio. 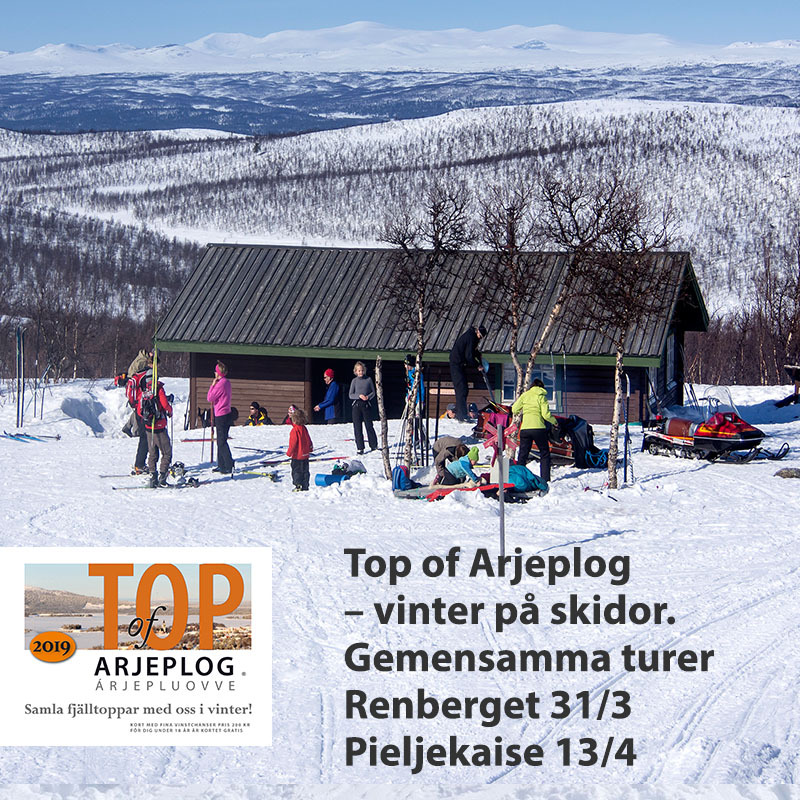 Sanna Valkonen and Jarno Valkonen, in turn, contribute as researchers, and Jarno Valkonen has also created a few photographs and videos for the exhibition. The project has been funded by the Kone Foundation. PHOTO: Ritva Torikka/Yle. Stina Aletta Aikio, Jarno Valkonen and Sanna Valkonen. The Viidon sieiddit project was launched by researchers Jarno Valkonen and Sanna Valkonen. «We got the idea when Marja Helander talked about the impact of mining and how the Sámi are disturbed by the prospect of increased mining in their home region, but still use, for example, silver brooches,» Jarno Valkonen explains. The two researchers invited artists to join them and began to build up the project. Valkonen wants to remind us that everything that we have comes from nature. Therefore, we should not use anything just once and then dispose of it. He notes that even the materials for glass and paper cups come from nature. «If we appreciate the connection between the environment and a cup made from the burl of a birch, maybe we could also appreciate the same link as regards other materials,» Valkonen says. Musician Ailu Valle and his team, which has also consisted of Raquel Rawn and Aqqalu Berthelsen, have created the soundscape of the project and the exhibition. The visitors can listen to it in the exhibition, and it will also come out as a record. Valle tells that when he was invited to join the project he had to think about it a while. «When I heard the theme, I realized that it could arouse controversy; therefore, I had to reflect for a while on whether to join the group. The project can arouse many kinds of thoughts. But now that we’ve completed the exhibition, I really think we succeeded well,» he says. PHOTO: Ritva Torikka/Yle. 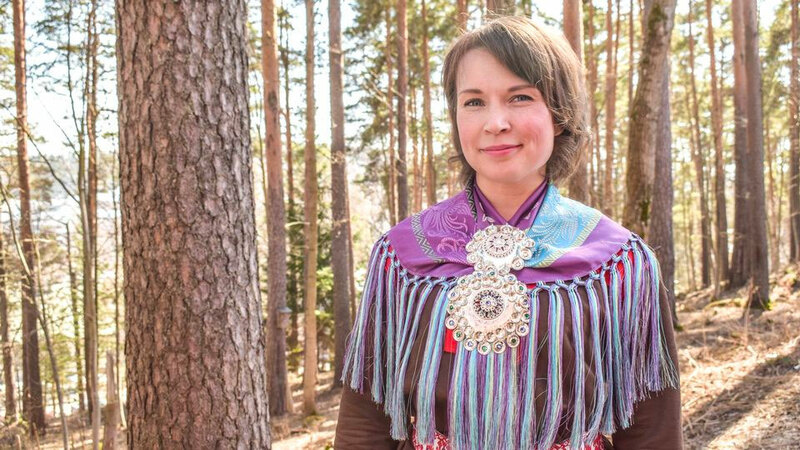 Ailu Valle wants to spotlight that the Sámi still have their own sources of livelihood and ways of living. According to Valle, the relationship the Sámi have with nature has changed over time. At present, the Sámi are part of the economic system just like everyone else, and the Sámi use the same vehicles and technological devices as others. 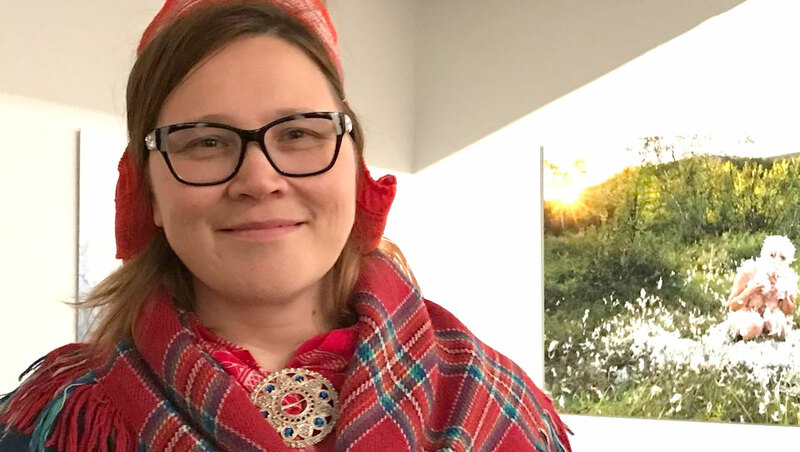 But according to Valle, it is still typical of Sámi to practice traditional livelihoods and to have a connection with and understanding of nature. «Plus a certain philosophy of life. And that is exactly what I want to spotlight. The Sámi view can turn out to be beneficial when we think of the present period of environmental concern: climate change and all those issues are so difficult. 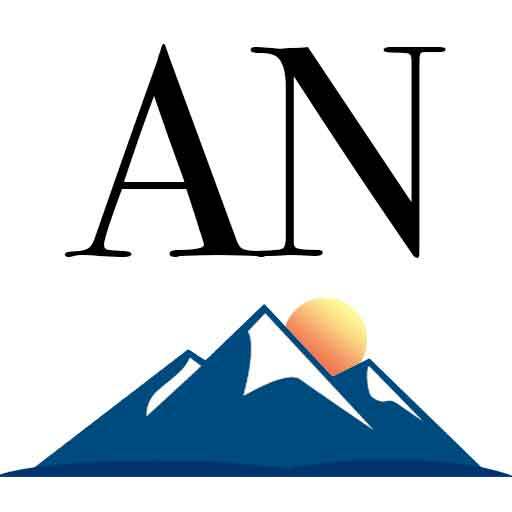 We really could try to live a bit less wastefully,» Valle suggests. 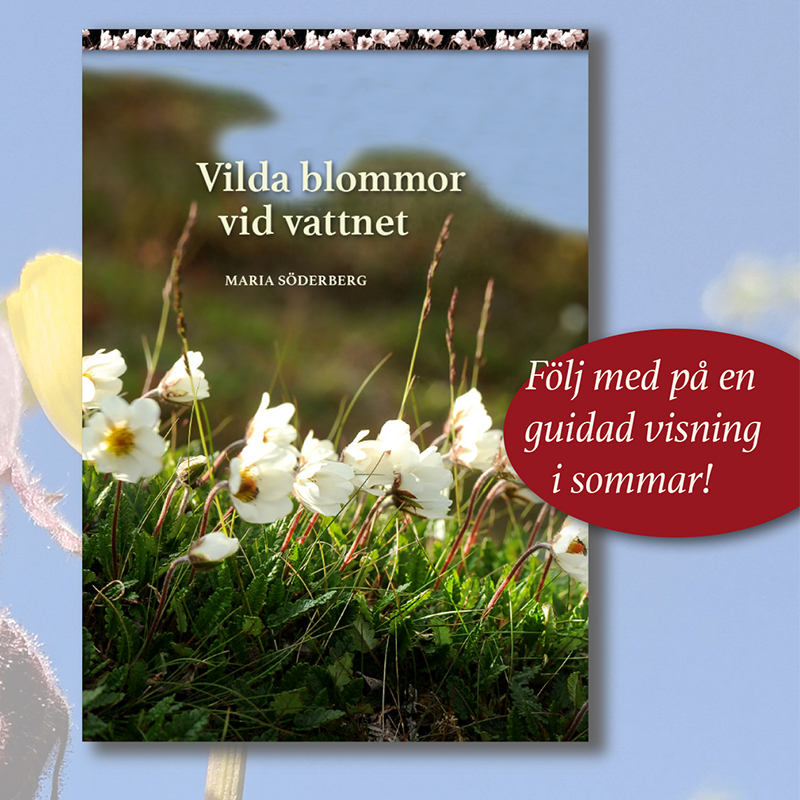 Marja Helander finds nature and everything that is happening here on the earth extremely interesting. She has reflected a great deal on, for example, the news on climate change and consumption. In Viidon sieiddit, she introduces the public to photographs that represent, for example, mining, waste and other ways of exploiting nature. After taking and completing the photos for this exhibition, she realized that all the images carried a rather gloomy feeling. «A few days before the opening, at night, I decided that I couldn’t let it be like that; I had to create one more positive photo too. Something with a feeling of hope. That’s why I made this beautiful picture and called it “Sacred and mysterious”. In the photo, Helander has used his father’s herbarium, or collection of plants. For her, this means that earlier generations also contribute to her photography. Marja Helander also feels that, for a non-Sámi, the Sámi way of living may seem very similar to the way in which people in the Nordic countries in general live. She also reflects on consumerism, referring to the Sámi band Ozas, which has also wanted to make people reflect on overconsumption. «I, too, reflect on consumerism and the impact it has on nature. I suppose everyone, including me, could think a bit more about how to do things in a better way,» she says. Nevertheless, Helander wants people to interpret her art freely, the way they want. Lately, she has tried to leave room for people to figure out things themselves. «Everyone can interpret my works as they wish. I try not to provide too clear explanations; I don’t want my works of art to turn into “statements”. Elle Máret Näkkäläjärvi was at the opening of the Viidon sieiddit exhibition in early October, and the exhibit made her think about many things. The photographs made an impression on her. They were different from what she had expected. PHOTO: Ritva Torikka/Yle. According to Elle Máret Näkkäläjärvi, a visit to the exhibition inspired her to reflect on many things. Behind her, a photograph by Marja Helander. «The world intensively tries to engage us in buying new things all the time; new phones and all those things,» Näkkäläjärvi reflects. Curator Áile Aikio from the Sámi Museum Siida says that, in this project, her role was to provide facilities for the exhibition. She feels that the exhibit gives rise to a range of thoughts and is also durable in a way: you can visit it many times, and it will give you new ideas every time. PHOTO: Nadja Mikkonen/Yle. Curator Áile Aikio from the Sámi Museum Siida says that Viidon sieiddit will give a spectator new ideas during every visit to the exhibition. «A majority of the Sámi no longer earn their living from livelihoods that are directly connected with the environment. We can live far removed from nature, so what is our relationship to the environment today?» Aikio asks. Viidon sieiddit – The New Dimensions of the Sámi Relationship to Nature is available for the public at the Sámi Museum Siida in Inari until spring 2019.